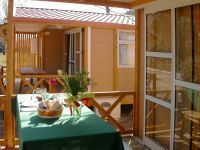 Our Bungalows, besides giving you the possibility to choose between smokers and non smokers bungalows, are integrated in the green and bounded on to the other by a laurel hedge and have a small, private courtyard. The bungalows are all composed of a veranda furnished with table and chairs, a bright living room, harmoniously furnished and divided from the kitchen through a bar, a kitchen fitted out with sink with two basins, cold and warm water mixer, stove with two plates, worktop, refrigerator of 140 l, kitchenware, cutlery, glasses and more, one bathroom with WC, shower and sink, both with cold and warm water mixer and another toilet. The sleeping area is composed of two bedrooms that can accommodate up to five people, according to type 1, 2 and 3 that can be seen on the maps on the bottom of this page. At last, all our bungalows are provided with: air-condition (warm/cold), reserved parking lot inside, set of bed linen - sheet and pillowcase-, a blanket and a pillow for every occupied bed (it is provided a free weekly linen change for stays that are longer than 14 nights). Pets not allowed from 07th to 20th of August, but always allowed in the other periods. 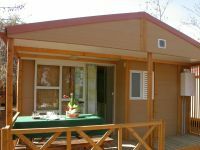 one bedroom with double bed (140x200), one bedroom with two single beds (70x200 each). one bedroom with double bed, one bedroom with a single bed and a bunk bed (70x200 each).